Earth Day was still an infant﻿, and the modern environmental movement was just getting its legs when the Yaudanchi Ecological Preserve was created in 1975. Click here for Tulare County Treasures website. First we at Friends of Yaudanchi would like to thank for your interest in saving the Yaudanchi Ecological Reserve. The community of Porterville, however, is close to losing a small but signifigant piece of open space. We discovered that the irrigation ditch would be replaced with a pipeline that would devastate Yaudanchi and remove public access to YER. The following is a chronological description of what has, what is, and what will be happening to protect this little "Jewel of the Tule River. Citizens got involved with CEQA regulations that the Vandalia Water District, Campbell-Moreland Ditch Company, Porterville Developmental Center, and CA Department of Fish and Wildlife must follow. Yaudanchi Ecological Reserve is approximately 162 acres and located on the eastern edge of Porterville, CA and immediately adjacent to Porterville Developmental Center. It is surrounded mostly by agriculture. It is owned by Porterville Developmental Center (California Dept. of Developmental Services) and has been (minimally) managed by California Dept. of Fish and Wildlife for 40 years. YER is also indicated in the Porterville General Plan as an open space of importance to the city and identified as a public use space. Add to that its importance to hundreds of wildlife and plant species and the fact that it is a component of the remaining Tule River floodplain, the strong argument can be made to keep it as such and even to enhance its function as an outdoor classroom for science, archeology, and history. Native people lived and gathered food and material from YER. Yaudanchi Yokut recently inhabited this land. The riparian areas along the Tule River have supported wildlife and plant species for countless centuries; cycles of flooding created wetlands and natural ground recharge areas. In 1860, when early day pioneers began to plant crops, a ditch was constructed by Chinese laborers to channel some water from the main Tule River to a few farms. This ditch did not significantly reduce the volume of the Tule River or change the nature of the riparian areas along the river; likely it provided water that was not ordinarily there during dry seasons. In 1958, construction began on the Success Dam on the Tule River; the dam caused significant changes to downstream riparian areas, but the small area that was traversed by the old dirt ditch survived as a riparian area likely because of the water escaping from the ditch. Little by little, farms and homes were built along the ditch and some parts of the ditch were lined with cement, however, for the area we call the Reserve, the dirt ditch remained and was its lifeline. WildPlaces youth volunteers planted native oaks on YER in 2009 as well as began a self-guided nature trail as part of its effort to create more outdoor classrooms. This past November, we discovered that the Vandalia Irrigation District was in the final stages of approving the piping of the portion of the dirt ditch that feeds the Reserve’s riparian area. At first we believed that our only battle was to protect the water supply for this Reserve by preventing the Irrigation District from piping the water. Our input to the Vandalia Irrigation District focused on the incomplete and inaccurate draft Mitigated Negative Declaration that was about to be signed. We surprised them by attending their public meeting – they did not appear to have expected any attendees. The Vandalia Irrigation District has not yet finalized the Decision; they said they would announce a continuation of the public meeting, but so far there has been no announcement of their intentions. We submitted input based on a very narrow understanding of the project. Now we have much more information. Our requests under the Public Records Act have resulted in much more information. Now we know there were many activities that occurred prior to their public notice. It seems to me that they had already decided to do the project before they had done any studies. We have dedicated people who have researched as much as possible. Documents and notes of their phone conversations and email messages are included. We had a lot to wade through. We had several questions : among them is the question of whether or not the State Department of Health should have followed CEQA prior to their decision to close the Reserve and to end the contract with California Department of Fish and Wildlife to manage it: i.e. not have anyone manage the Reserve – to end it as a protected area. If they should have prepared CEQA documents, then we needed to challenge them right away. There is a strong possibility that the State has intentions to sell the land or to expand their facilities to accommodate their expected increase in “forensically challenged” clients (criminally insane). OF course, if they have such plans, then they should be part of any CEQA analysis. As for the project to pipe the ditch, in June 2018, we managed to have an incredible victory: The VWD Board voted to NOT build the pipeline...at least for now, we speculated. (Yes, the Friends of Yaundanchi did take a moment to celebrate). To prevent this, and usher in a new public space for Porterville, our next step is to find a land managing entity to take lead on ensuring that Yaudanchi's ecological, cultural, and community functions be kept in tact. Biological survey revealed myriad of plant and animal species dependent on the water the escaped the irrigation and percolated into the sandy soil of this piece of the Tule River watershed and flood plain. The Yaudanchi Ecological Reserve (YER) is a small piece of land (about 155 acres) inside the Porterville city boundaries. It is owned by the State of California and attached to the Porterville Developmental Center, bordering on the south side Highway 190. Formerly part of the Tule River channel, it was cut off from that supply of water when the Success Dam was built, but until now it continued to receive water ﬂow from the Campbell-Moreland Ditch, which is an open channel. It was declared an Ecological Preserve in 1976, open to the public and managed by the California Department of Fish and Game (now called the California Department of Fish and Wildlife). The YER has a signiﬁcant amount of riparian (river) vegetation, containing willow (Salix sp. ), cottonwood (Populus sp. ), valley oak (Quercus lobata), and sycamore (Platanus racemosa). Kit fox, several raptors, and other species have been reported from the site, and it has hosted a Blue Heron rookery.! ! Recently, the Vandalia Irrigation District (VID) proposed to convert the open ditch crossing the property to a closed pipe. In November, VID issued a CEQA document (California Environmental Quality Act) stating that this action would have a minimal negative impact on the site. I obtained a copy of the document (Notice of Intent to Adopt and Consideration of Mitigated Negative Declaration). The document states that the removal of water would have a negligible effect on the habitat at the site, but gave no evidence to support such a statement. The document also contains a letter from CDFW (CA Dept. of Fish and Wildlife) stating that the removal of water from enclosing the ditch in pipe would have a signiﬁcant negative effect on the property. However, after this letter was received by VID, the Porterville Developmental Center (who controls the property), requested that the land be removed from protection as an ecological preserve. As the preserve designation was an agreement between CDFW and PDC, and could be cancelled at the request of either party, the request was granted. (PORTERVILLE, CA)— In the fall of 2017, with no public notice and no public input, the Porterville Developmental Center terminated its agreement with the Department of Fish and Wildlife to manage the Yaudanchi Ecological Reserve (Yaudanchi). Located east of Porterville, Yaudanchi consists of over 160 acres of rare undeveloped Tule River floodplain habitat, providing upland and wetland habitat for a wealth of plants and animals, and until recently, people. 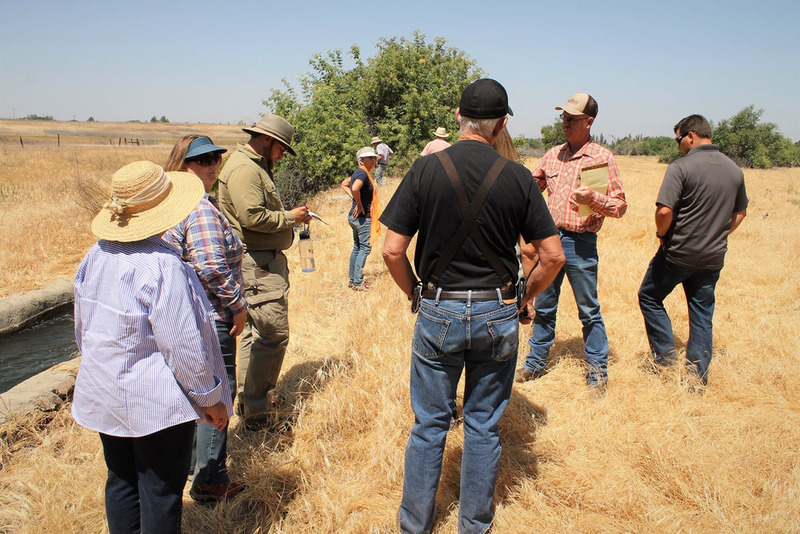 The Porterville Development Center (PDC) “owns” the State land, and the California Department of Fish and Wildlife (DFW) has managed it for habitat, wildlife and the public. For forty years, the Reserve has served as a public space with hiking trails, open to visitors and serving as an educational outdoor classroom. In November 2017, a few persistent citizens learned that “the pipeline” consisted of piping the ditch that had sustained the downstream lands (now in the Yaudanchi Reserve) after the Success Dam was built. A small classified ad in the Porterville paper on November 16, 2017 stated that the Vandalia Water District (VWD) was intending to adopt the proposed pipeline project. It failed to mention that the ditch section to be lined was on the Yaudanchi and would effectively ensure its demise. The PDC’s termination of its contract with the Department of Fish and Wildlife was given with no written explanation and no public involvement. It has now come to light that over the last few years, behind the scenes and hidden from the public eye, the Vandalia Water District, the PDC, and the City of Porterville conspired to effect Yaudanchi’s closure. After Success Dam was built, most of the water was cut off to downstream riparian (river) habitat except for this small area. Between 1975 and 1977 in a determined effort not to lose this rare remaining piece of the Tule floodplain, diverse groups including Tulare County Board of Supervisors, Kern and Tulare Audubon, Tule Indian Reservation, Springville Farm Bureau and the Porterville State Hospital’s Advisory Board along with many more came together to save it. They urged the state to retain the property and turn it into a preserve. It’s name, Yaudanchi, is Yoqut for “low land peoples” The Porterville State Hospital (now PDC) then vowed to save “in perpetuity” this rare undeveloped land. Yaudanchi: Local Treasure Saved or Public Land Lost? There are three things Mehmet McMillan wants to see regarding the Porterville Yaudanchi Reserve: restoring public access to the reserve, putting the reserve’s signs and amenities back up, and hiring a good management agency to manage the reserve. Simple requests, but ones that won’t be simple to get. Why? Because in the Fall of 2017, with no public notice and no public input, the Porterville Developmental Center (PDC), which owns the reserve, terminated its agreement with the California Department of Fish and Wildlife to manage the Yaudanchi Ecological Reserve. Located east of Porterville, Yaudanchi consists of over 160 acres of rare undeveloped Tule River floodplain habitat, providing upland and wetland habitat for a wealth of plants and animals, and until recently, people. When concerned citizens discovered last fall the reserve had been closed to the public, their repeated calls to the PDC yielded no information other than the fact that Yaudanchi was no longer a reserve. In November 2017, a few persistent citizens learned that “the pipeline” consisted of piping an unlined section of the Campbell-Moreland Ditch. Seepage from the ditch, dug in 1860, that had sustained the downstream lands (now in the Yaudanchi Reserve) after construction of the Success Dam greatly reduced natural river flows in the floodplain. A small classified ad in The Porterville Recorder on Nov. 16, 2017 stated that the Vandalia Water District (VWD) was intending to adopt the proposed pipeline project. “It failed to mention that the ditch section to be lined was on the Yaudanchi Reserve and would effectively ensure its demise,” McMillan said. However, Steve Drumright, the general manager for Vandalia Water District and Campbell-Moreland Ditch Company, said the proposed pipeline project, which consists of replacing an open ditch, has been put on hold. If the project were to move forward, Drumright said it would have virtually no impact to the reserve. But local conservation groups such as WildPlaces, and chapters of the California Native Plant Society (CNPS), the Audubon Society, and the Sierra Club say that stopping the critical seepage from the unlined ditch into the reserve would drastically impact the habitat and wildlife that the reserve was established to protect. “The whole project and the whole ecosystem has to be considered,” said Joan Parker, representing Audubon. She expressed concern that the pipeline project documents did not adequately describe how both resident and migratory birds rely on the reserve habitat and how shutting off the extensive historic flow of water from the ditch into the reserve would affect them. Drumright said the reason for proposing the pipeline project in the first place was to prevent losing water. Nevertheless, Drumright said he believes the Vandalia Water District will attempt to get the project going again in the future. “We had so much opposition and have spent so much money on this already that we just finally said just pull the plug on it until a later date,” Drumright said. McMillan said even though things aren’t working out right now with regard to the pipeline project, he is hopeful about the future. “Although the environmental community put pressure on the Vandalia Water District to the point that they decided not to build a pipeline, there’s still things that we can work on together with this agricultural community to help them meet some of the tough regulations that they have to deal with in their line of work,” McMillan said. Whatever ends up happening, McMillan said he just wants Yaudanchi to be intact.